Health Informatics is one of the fastest-growing job sectors in the healthcare industry. As the job demand grows, more universities are responding by creating cutting-edge graduate programs. With part-time and online options, these graduate programs also cater to working professionals. Thinking about a lucrative career change? Keep reading! These are our choices for the 25 Best Master's in Health Informatics programs. Health Informatics is an interdisciplinary scientific field dealing in biomedical information, data, and knowledge. Due to its many applications, a Master's degree in Health Informatics opens up an array of high-earning jobs. In an HI graduate program, students learn the relationship between information technology and the healthcare system. Thus, common curriculum includes courses related to health data analytics, health informatics management, and other topics that focus on the integration of information technology and the healthcare profession. Most programs also feature concentrations or tracks that allow students to specialize in subprograms, such as cybersecurity or ethics. While not always required, more prestigious programs often require a practicum or internship in a healthcare setting as well. As hospitals and other health centers across the country continue to convert to electronic medical record systems, jobs in the health informatics field rise. In fact, according to the U.S. Bureau of Labor Statistics, jobs for health information technicians will grow 13 percent between 2016-2026. As the need for technicians to organize and manage information associated with the healthcare industry grows, open positions become more prevalent and profitable. This field is a good fit for those who want to stay on the front lines of medicine and technology. Graduates of Master's in HI programs work in hospitals, insurance companies, government agencies, health IT software companies, and more. The Health Administration M.S. at Saint Joseph's University is intended for healthcare professionals interested in advancing into administrative and management positions. Therefore, applicants must have at least two years of work experience in the healthcare field to be eligible for the program. With a part-time and full-time track, the Health Administration M.S. program offers core courses focused on health administration, organization, and ethics. This program also features two concentrations: Health Informatics Concentration and Organization Development and Leadership. With just six extra credit hours, these concentrations open up a wider range of career possibilities after graduation. Students will leave prepared for roles such as a Hospital Administrator, Operations Manager, or Health Informatics Specialist. Known for its strong industry connections, this program supports students hoping to start a new and exciting career path. Fortunately, with both online and on-campus programs, Northeastern University caters to working professionals and new graduates alike. Required core courses provide an introduction to Health Informatics and overview of the American healthcare system. After completion of introductory courses, students will elect to take courses from the Business Management, Health Informatics, and Technical fields. This program also offers three graduate certificate programs: the Graduate Certificate in Health Informatics Management and Exchange, the Graduate Certificate in Health Informatics Privacy and Security, and the Graduate Certificate in Health Informatics Software Engineering. Fortunately, all of the courses within these concentrations also apply towards the Master's degree if students wish to pursue further education later on. Lipscomb University boasts a unique multidisciplinary MHCI program. Instead of deciding on a concentration, students are required to take courses in all areas of Health Informatics. The topics include leadership and organizational behavior, data management, and predictive analytics. This program also caters to working adult students by offering weekend classes. Furthermore, each incoming class will join the program's "cohort system." This system ensures that students starting together remain in the same courses until graduation, thus building a meaningful support network. For those unable to complete the full degree, Lipscomb University also offers a 15-credit Graduate Certificate in Health Care Informatics. Temple University's Master in Science in Health Informatics is a 30-credit hour program. Its diverse array of students include current healthcare professionals, information technology officers, and others. MSHI students also have the option of either enrolling online or taking classes at the downtown Philadelphia campus location. With concentrations such as Cybersecurity, Data Analytics, and Population Health Management, this program has a reputation for maintaining a cutting-edge curriculum. Most students earn their degree within two years when attending on a part-time basis. Furthermore, graduates should leave the program with a vast knowledge of the modern digital healthcare environment. Designed for current healthcare professionals, Regis University's M.S. 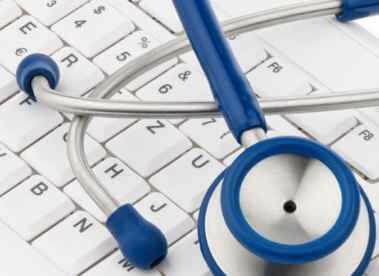 in Health Informatics is a 36 credit hour online program. Each class runs eight weeks long and begins in January, May, or August. Due to the organization of courses, students can conceivably finish the degree within two years. The program is focused on providing students with skills in both the technology and management of information sectors. Plus, in order to prepare students for a "real world" setting, the curriculum relies on case studies and applied projects. After finishing core requirement classes, students can also choose from two different tracks: the Information Technology track, or the Health Care Services Track. This intense one-year, full-time graduate program prepares students for informatics leadership positions. Currently, most classes are only offered on the prestigious John Hopkins University campus. Yet, the program is expanding its offerings of online courses in the upcoming academic year. Students are required to complete ten core courses, including Database Querying in Health and an Introduction to Public Health and Biomedical Informatics. Applied MS students must also complete an online ethics course. Students are given the opportunity for specialization as well. This program offers elective courses in the areas of management, informatics, computer science, non-clinical informatics, and research design and evaluation. University of California Davis offers a competitive and career-driven Health Informatics Master's Degree program. Each student participates in a mandatory independent research project and thesis. The ultimate goal is for students to craft papers that could be considered for publication in a peer-reviewed journal. The curriculum also includes five core courses, as well as a minimum of 19 units of domain elective courses. These elective courses cover a range of relevant topics, including computer security, database management, and web-based enterprise. Students typically finish their coursework and thesis within 18 months to two years. This large university is also unique in its offering of additional elective courses through participation with several other graduate schools. University of Washington's Master of Health Informatics & Health Information Management program offers a unique and hands-on curriculum. Designed to accommodate working professionals, classes are scheduled just once per month on-campus and one night per week online. This 54-credit program entails 18 required courses and one capstone project. Although courses are subject to change, topics focus on organizational behavior, project management, health information systems, and ethics. The capstone project provides students with an opportunity to apply their newly-learned skills to a real life work scenario. With part-time, full-time, online and on-campus options, this program caters to busy mid-career professionals. The Master of Science in Health Care Informatics degree features 23 credits of core courses, six credits of electives, and either three credits for a final projects or six credits for a thesis. Altogether, students are required to finish 32 or 35 credits, depending on their choice of project or thesis. Core classes include Computational Intelligence in Health Informatics, Healthcare Information Systems Analysis and Design, and Healthcare Systems Applications. The curriculum has a reputation for preparing students for highly marketable careers. Furthermore, students will be exposed to top-notch research and technology. George Mason University offers both online and on-campus programs. Both options boast excellent faculty and rigorous coursework. Students have the choice of completing a Capstone Practicum or Master's Thesis, resulting in a total of 33 to 39 credit hours. Furthermore, the degree can be completed in two to three years, depending on whether students choose part-time or full-time tracks. The Master of Science in Health Informatics also features three concentrations: Health Data Analytics (online and on-campus options), Health Informatics Management (on-campus only), and Population Health Informatics (on-campus only). Whatever options students take, they'll be immersed in information about the healthcare industry, technology, and the integration of both fields. This Master of Science in Health Informatics program is primarily intended for working healthcare professionals looking to specialize in new fields. Part-time students should complete the degree in six semesters. Full-time students should finish in four. Although the majority of courses are offered online, students are required to attend one on-campus course per semester. In order to accommodate busy schedules though, these on-campus sessions are usually scheduled as a four-day long weekend. The MSHI program also offers unique electives, such as "Healthcare Marketing" and "Health Behavior and Epidemiology." After graduation, students will be eligible for careers in data analytics, clinical systems, healthcare information technology, and beyond. MSHI students at Marshall University undergo a rigorous and rewarding curriculum. Reflective of the integrative nature of Health Informatics, program courses are offered by three separate departments: the College of Health Professions, the College of Business, and the College of Information Technology and Engineering. In total the program requires 39 credits. Students must also complete at least 400 hours of a Health Informatics internship at one of the many program-approved job sites. This practicum provides hands-on experience in academic, healthcare, and government industries. It also exponentially increases the job opportunities for post-grads. The MHI program from the University of Minnesota-Twin Cities attracts a diverse and competitive field of candidates. It's primarily intended for medical students and professionals already working in the healthcare industry or technology sector. Completion of the 31-credit professional degree can take one very intense year, or up to five years. Most full-time students take at least three semesters to finish the coursework. Required courses include Biostatistics, Consumer Health Informatics, and Healthcare Analytics and Data Science. MHI students also must complete a three-credit capstone project. With the help of an advisor, students are presented with the opportunity to apply their knowledge and skills to a project of their choosing. With its long history of health and biomedical informatics research, the University of Missouri's MSHI program prepares students for a number of diverse career opportunities. Core curriculum includes classes in health information systems and information management. The program emphasizes research methods and outcomes analysis. Additionally, this program boasts a 12-week internship program. Although it's not required, these internships are arranged through the university and provide important hands-on job training. Whether students tackle an internship or not, they must complete an independent research project. The University of South Florida is widely recognized for its prestigious on-campus, online, and medical programs. The courses offered through the Master of Science in Health Informatics program prepare students for senior-level positions across the country. Requirements include 32 credit hours, the equivalent of 11 courses. Students must complete four core courses, including Integrated Electronic Medical Records and Health Data Management. From there, the curriculum includes five required courses and a range of interesting electives to choose from. While this program attracts a range of competitive students, it's particularly designed for healthcare providers, IT professionals, and others working in the healthcare industry. The Master of Science in Health Informatics from Northern Kentucky University is a 33 credit hour program. Additionally, students with less academic and professional experience in the healthcare field may be required to take a clinical class. The program's core curriculum provides job-boosting organizational and technical skills. Yet, all MHI courses focus on the systems, science, and software behind new technologies in the healthcare industry. The program requires the completion of 21 credits of Foundation Classes, as well as 9 credits of Elective courses. Finally, before graduating, students must create a 3-credit capstone project and an electronic portfolio. This portfolio showcases student work. East Carolina University's Master of Science in Health Informatics and Information Management program is fast-paced and highly regarded. The only CAHIIM-accredited program of its kind in North Carolina, it offers excellent research and community engagement opportunities. The 39-credit hour program also features a well-rounded curriculum that prepares students to take on leadership and technology roles in the healthcare industry. Furthermore, courses are available either on-campus or online. The MS HIIM includes an internship component. With 120 hours of hands-on experience, this internship provides East Carolina students with skills and practical experience to be successful in the workplace. The Master of Science in Applied Health Informatics is a full-time program completed over 15 months. Courses are offered at Stony Brook's Southampton campus in a traditional structure. Students enroll in fall and spring semesters, as well as four short summer sessions. This 52-credit hour program is also well-known for its "real world" curriculum. Designed with the assistance of healthcare and IT professionals, students quickly develop relevant workforce skills. In fact, by graduation students will have completed 480 hours of practicum experience at healthcare centers and organizations. This practicum provides Stony Brook students with career training that makes them into highly-desired job applicants. The Health Informatics graduate program at the University of Kansas has a strong reputation for its goal-oriented curriculum. Students enrolled in this program must complete 40 credit hours. The program's courses are split into three required sections: informatics, leadership, and research. Students also have the choice of three disciplines: clinical, health policy and management, or public health. In their final semester, students must produce a research project and a 200-hour practicum. These opportunities vary depending on the chosen discipline. Although rigorous, this program is also flexible enough to attract working professionals. Options include both part-time and full-time status, and a majority of courses are available online. The MS in the Health Informatics program at the University of Iowa has a reputation for excellence. With both a thesis and non-thesis option, students can tailor the program to their interests and skills. Students are required to complete a minimum of 32 credit hours. The curriculum includes two introductory courses, three foundational courses, and one course on statistics and research methodology. Since the U of I strives to make each student's plan of study unique, there is also a massive range of elective classes to choose from. In fact, students can take elective classes from the Business, Engineering, Liberal Arts and Sciences, Medicine, Public Health, and Graduate Colleges. This 36-credit hour program from the University of North Texas is known for its high student success rate. The program focuses on the diverse areas in health information management, including electronic health systems, legal concerns in health informatics, ethics, and clinical decision support. Students must complete a practicum unless their past professional experience is extensive and relevant enough to warrant an internship unnecessary. Given the competitive nature of this program, students must also take and pass a comprehensive examination or complete two advanced seminars. Required core courses include: Information and Knowledge Professions, Information Organization, and Information Access and Knowledge Inquiry. The guided and general electives are wide-ranging though, allowing students to dive deeper into their particular interests. An important feature of this 52-credit hour program is the internship experience. Like other programs, University of Michigan's internships help students develop skills, resources, and a deeper understanding of the "real world" issues addressed by the field of health informatics. Students must take five core classes, as well as select courses in other specialized areas. These areas include core health informatics, health system and organizational studies, human and social behavior, methods, and information management, retrieval and design. Through this program's core curriculum, students develop skills and techniques for design, analysis, and management. University of Michigan's program is also known for enriching the education of their students through vibrant discussion, guest speakers, and student presentations. The 36-credit hour Health Informatics and Analytics program at UNC Charlotte has a reputation for top-notch faculty and resources. With its focus on preparing students for careers in health data science, both part-time and full-time students graduate as experts in their specialized field. Every student receives a thorough background in data science, system architecture, and health analytics. With all evening classes, the on-campus program also caters to working professionals. Furthermore, the curriculum stresses group learning and "real world" activities. Students are required to finish an internship and a series of capstone courses before graduation. These hands-on experiences help students develop skills highly valued by employers. In the Master of Science in Health Informatics degree program at Indiana University, students build knowledge of the American healthcare system and master concepts in health information technology, information science, and other fields. Students develop skills in analytics and organization, thus preparing them for careers involving the protection of medical data. Best of all, the prestigious, 36-credit hour program is available to both part-time and full-time students. Additionally, with a focus on allowing students to personalize their degree to meet their own career goals, the program features an extensive list of elective courses. UNC-Chapel Hill's health informatics graduate program is highly-regarded for preparing students for the advanced field of health informatics. Available both online or on-campus, the 35-credit hour degree is completable with 16 months of full-time study. A part-time and "fast track" option also exist. The degree emphasizes personal development through its elective courses in specialized areas. Still, all students also undertake a rigorous core curriculum. Twelve hours of core informatics coursework must be completed, as well as courses in biomedical and health informatics foundations, business fundamentals, and either the areas of clinical or public health. Students in this esteemed program must finish a 400 hour minimum internship in a track of their choosing as well.